West Fulton Arts works in partnership with local schools to deliver residency programs that create outstanding artistic and learning experiences for young people of all backgrounds. West Fulton Arts hosted a workshop for Middleburgh Jr./Sr. High School students to learn the basics of stop-motion animation. The participants learned how to use animation software, built their own puppets and sets, and were introduced to animation concepts like placement, framing, direction, and speed. By the end of the 4-hour workshop, the participants created their own short film. New York City-based puppeteer and educator spent a week with teacher Teresa Norfolk's art class, providing a hands-on puppet-making workshop and giving students valuable practical experience and insight into puppet construction and manipulation. 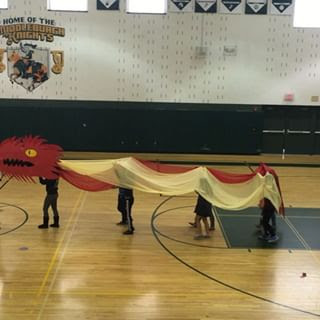 The result of their hard work was a gargantuan red and yellow dragon puppet that can be handled by multiple students. The giant dragon puppet that made its debut during the opening parade at the 2nd Annual West Fulton Puppet Festival, 2016.